I made myself a new desktop wallpaper from an elephant I folded awhile back. I don't know where the actual elephant is anymore, but his likeness is now on my monitor. 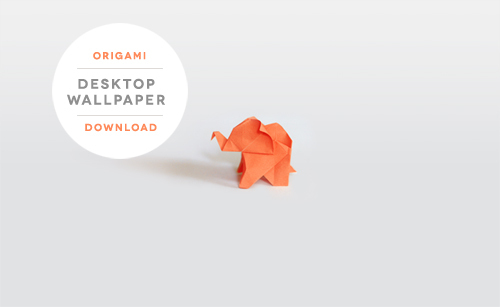 Should you need an orange paper elephant for your desktop, download him here (1920x1080 px). To fold your own elephant, follow the instructions at at Origami Spirit. Just discovered you blog Jessica. Coincidentally my blog is called The Orange Gift Bag. I love elephants of all shapes, sizes and materials. This one is adorable! Great inspiration for a boys nursery as well! brings me utter joy every time I open my mac. this is now my desktop. he makes me happy every time i see it. thank you!